This post is sponsored by SheSpeaks and P&G. I am being compensated for helping spread the word about #GameDayTraditions and Walmart, but Kathy's Calm To Chaos Life only shares information we feel is relevant to our readers. SheSpeaks and P&G are not responsible for the content of this article. Game Day Traditions are pretty common in my household. We are HUGE football fans. We live in a smaller pro football market, but our team has a huge following. Every football fan has superstitions and this household is no different. There are certain routines or traditions that take place each and every game day. Game days always include cleaning the house, at least a few loads of laundry, taking a shower, doing my make up, and of course putting on my "good luck" jersey! Yes, I do have a lucky jersey and if my team is doing bad I change it to another lucky jersey. I did say I was game day superstitious, right? I totally am. Going to the game or watching it at home involves different traditions for each. But, there is one thing that does not change and that is my beauty routine. After showering I always put on moisturizer before my make up. If there is one beauty item I always have to put on for game days it is a good mascara. I love mascara, it just makes my blue eyes look more blue. One of my favorite mascaras to use is COVERGIRL Lash Blast. 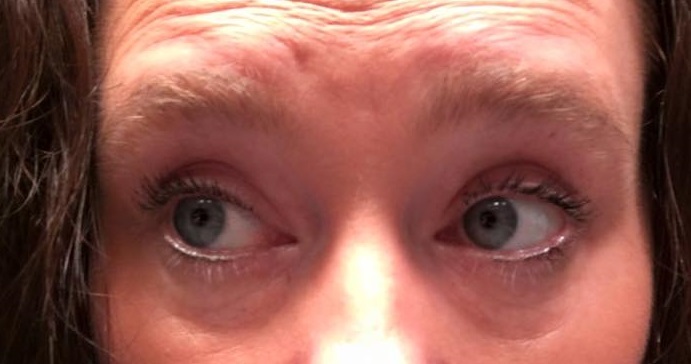 Lash Blast goes on well, does not clump, and always makes my lashes look their best. What more could I ask for in a mascara? Nothing, I tell you, nothing! Lash Blast does it all for me. See how awesome my lashes look!! But what game day wouldn't be complete without some great food. We have done many different types of food items from grilling to baking to frying. Everything from chicken to steak to veggies. Either on the grill or in the smoker! We are a football loving foodie family for sure. Eating all the delicious dishes that have passed over my counters, and also while at the game itself, can sure pay the price on my teeth. I'm one of those that has to constantly brush my teeth (at least three times a day). 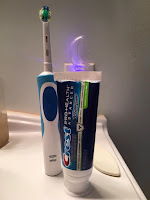 So far my favorite way to brush my teeth is with the Oral B Vitality Rechargeable Toothbrush. My teeth feel so clean after using it. 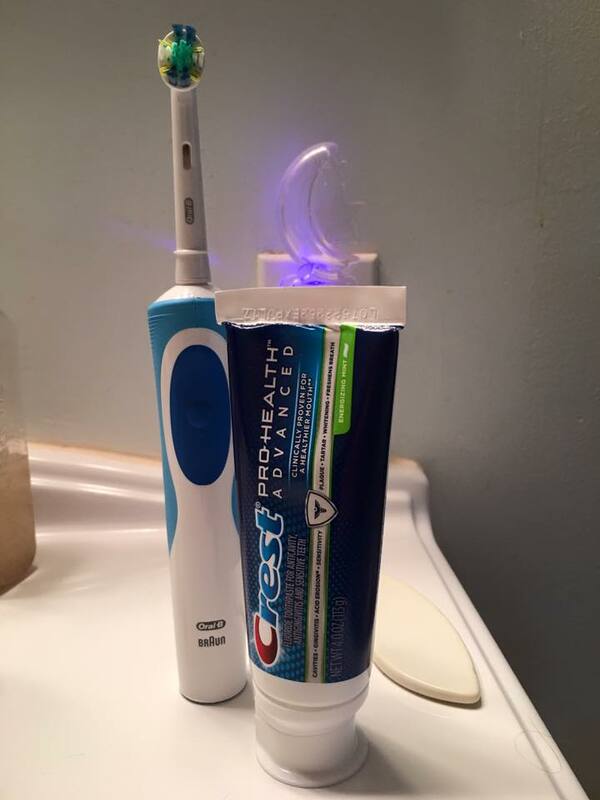 My toothpaste of choice is Crest ProHealth Advanced. The combination of the two just make my teeth and mouth feel as if I had just left the dentist. I love the feeling of clean teeth. These are my #GameDayTraditions. I try to follow my traditions every game day, but sometimes that is just not possible. 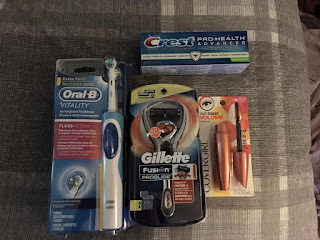 When I'm ready to start a new tradition I can simply head on over to my local Walmart and shop for more awesome P&G products to help me create new traditions. I love trying new make-up or even for special occasion games even do my make-up in the color of my favorite teams. Blue eye shadow - red lipstick, Just Saying! Unlimited possibilities showing my team spirit off! You can purchase all the great P&G Products featured above by visiting your local Walmart. Walmart and P&G are celebrating 50 Years of Game Day Traditions, you can find out more by clicking here, Shop for your Game Day items that are a part of any Game Day Tradition. Make sure to head on over and check out Walmart and P&G's on Facebook to learn more about Game Day Traditions. Share some of your own Game Day Traditions by using the #GameDayTraditions hashtag on Twitter. Be sure to follow both @Walmart and @ProcterGamble too.